Mark your calendars for Friday March 15 to Sunday March 17. 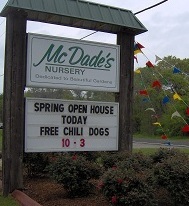 To officially kick off the spring gardening season, McDade’s holds their annual Grand Spring Opening in mid-March. As is tradition we’ll be serving our free 'Lake-Famous' chili dogs along with all the condiments and drinks to our customers. In previous Open Houses we have cooked upwards of 500 dogs. Each day there will be $50 door prizes from our vendors. We highly recommend you arrive early as the parking lot fills up fast. Sign up for our Newsletter for more information on the Spring Open House.